Non-conference matchup between the playoff bound San Antonio Spurs and the lottery bound Atlanta Hawks. In many ways, this matchup has a similar dynamic to today’s other SPORTS INSIDER featured NBA play between the Los Angeles Lakers and Oklahoma City Thunder. The Spurs aren’t going to quit down the stretch but like OKC their playoff seeding is pretty well set. Finish 8th, they get Golden State in the first round. Finish 7th, they get Denver in the first round with the Nuggets having home court advantage. Neither scenario is a good one. San Antonio is in better form than OKC (who among playoff bound teams isn’t?) winning 6 of 10 but this is far from being legendary head coach Greg Popovich’s ‘first rodeo’. He’s well aware of the team’s situation and that if the team is going to make either potential first round series competitive his stars need to have their workload reduced for the remainder of the regular season. No one will say it publicly, but the Spurs could be resigned to the fate of an early playoff exit. Denver is neck and neck with Milwaukee for the best home record in the NBA (31-7) and although the Golden State Warriors have notoriously not always had great focus at home there’s every reason to expect that to change when the playoffs start. For that reason, you really have to draw a line through the Warriors’ 27-11 home record so far this season. The Spurs have been awful on the road going 14-24 SU/17-19-2 ATS. The 14 road wins is tied with Detroit for fewest by a playoff bound team and doesn’t bode well for the Spurs’ chances in either potential first round matchup. They have been solid at home going 30-9 SU/24-15 ATS but are just 16-14 ATS as a home chalk. The Atlanta Hawks are a downright inexplicable team this season. They’re bad though there are some signs of life in the ATL. 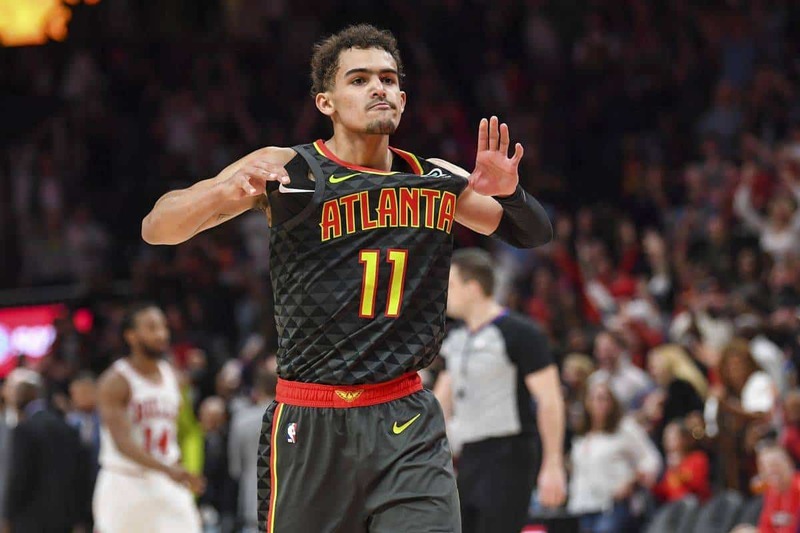 Rookie point guard Trae Young has been playing like a man possessed in the second half of the season to the point that Luka Dončić winning the Rookie of the Year award is no longer a foregone conclusion. Making the Trae v. Dončić ROY race all the more intriguing–they were traded for one another on draft night. Atlanta originally selected Dončić who sent him to Dallas for Young. Initially, it looked like the Mavs were the clear winners of the deal but now it’s not so clear cut. Since the All Star Break, Young has averaged 25.8 PPG, 9.0 APG and 4.4 RPG. He was inconsistent before the All Star Break though he definitely showed promise early. In his third game in the NBA Young scored 35 points and dished 11 assists. Only 8 rookies in NBA history have gone for 35 points and 11 assists in a game, the last coming in 2010 when a kid out of Davidson College in North Carolina named Steph Curry achieved the feat. No disrespect to Dončić who is an exceptional player but he might end up being more of a ‘complementary’ weapon in the NBA. Young is a guy you could build a franchise around. Atlanta is another team showing some moxie down the stretch. The Hawks have won 4 of 5 both SU and ATS and it hasn’t come against a schedule full of cupcakes. During the run they’ve beaten Milwaukee, Philadelphia and Utah at Home along with New Orleans on the road. Since mid February the Hawks are 14-6 ATS. Their road record is particularly interesting and in a strange way it has benefited from having one of the weakest home courts in the NBA. For the season, the Hawks don’t have a lot of wins away from home with a 12-26 SU record but for the most part they’ve been extremely competitive going 22-16 ATS. They’ve only been favored on the road once this year so the bulk of their pointspread success away from home has been as a road dog (11-26 SU/21-16 ATS). Hawks do have some injury issues–John Collins and Taurean Prince are listed as ‘doubtful’ and the team just lost starting center Dewayne Dedmon to a season ending ankle injury. That might be to our benefit–it might put the ball in Trae Young’s hands more often and he might put up some numbers to buttress his ROY case. San Antonio has failed to cover their past two home games, both as double digit favorites. No reason that Atlanta can’t make it three straight ATS losses for the Spurs in that role.